More than 15,000 people have signed a petition to allow a police dog to retire with her handler. Sgt David Evans, from Shropshire, is "heartbroken" at the prospect of not being able to keep four-year-old Ivy when he retires, his daughter said. She set up an online petition to gather support for her father, who is stepping down in April after 34 years' service. The chief constable has "made a direct offer" to speak to Sgt Evans. Police dogs normally retire about age eight. Sgt Evans, 59, has been told he will have to pass the animal - a Malinois cross German Shepherd - on to another handler to continue working, the family said. The petition has been signed by people from as far afield as Canada and New Zealand. Daughter Jennie said the response was "incredible". She said Sgt Evans, of Market Drayton, had offered to buy Ivy and cover the cost of replacing her. Ms Evans said: "Dad sacrificed many family moments with the support of his wife to enable him to undergo months of training with his police dogs. "West Mercia need to show they appreciate these efforts and do not treat dogs as dispensable equipment that can be 'handed down' to other people." 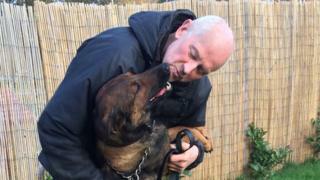 West Mercia Police said Chief Constable Anthony Bangham "recognises the unique bond between an officer and his dog and has made a direct offer to speak to the officer personally about this".